- April 1981, a group of emigrants Isaaq living in Jeddah, Saudi Aribi formed the Somali National Movement (SNM) and the end of 1981 was announced in London, which subsequently became the strongest of Somalia's various insurgent movements . According to their spokesmen, the rebels wanted to overthrow the dictatorship of Siad Barre. In addition, the SNM advocated a mixed economy and a neutral foreign policy, rejecting alignment with the Soviet Union or the United States and calling for the dismantling of all foreign military bases in the region. In late 1980, the SNM adopted a pro-Western foreign policy and favored U.S. participation in a post-Siad Barre, Somalia. Other objectives included the establishment of SNM a representative democracy that guarantees human rights and freedom of expression. Finally, the SNM moved its headquarters from London to Addis Ababa to obtain military assistance from Ethiopia, which initially was limited to the former Soviet Union in small arms. In October 1981, the SNM rebels elected Ahmad Mahammad Ahmad and Culaid Abdi Ismaaiil as president and general secretary respectively of the movement. 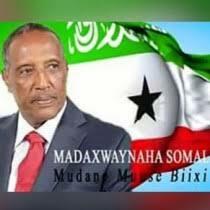 Culaid had been involved in politics in northern Somalia until 1975, when exiled in Djibouti and then in Saudi Arabia. Abdi had been politically ctive in the city of Burao in the 1950s and from 1965 to 1967, he served as minister of the Somali Government planning. After the authorities jailed him in 1971 for antigovernment activities, Abdi left Somalia and lived in East Africa and Saudi Arabia. The rebels also elected an executive committee of eight men to oversee the military and political activities of SNM. On 2 January 1982, the SNM launched its first military operation against the Somali government. Operating from Ethiopian bases, commando units attacked Mandera Prison near Berbera and freed a group of northern dissidents. According to the SNM, the assault liberated more than 700 political prisoners; subsequent independent estimates indicate that only about a dozen government opponents escaped. At the same time, other commando units raided the armory Cadaadle near Berbera and escaped with an undetermined amount of arms and ammunition. Mogadishu responded to the SNM attacks by declaring a state of emergency, imposing a curfew, closing of gas stations to civilian vehicles, banning movement in or out of northern Somalia, and launching a search for the Mandera prisoners (most of which were never found). On 8 January 1982, the Somali government also closed its border with Djibouti to prevent the rebels fleeing Somalia. These actions do not stop the military activities of the SNM. In October 1982, SNM sought to increase pressure against the Siad Barre regime by forming a committee with the SSDF jointmilitary. Apart from issuing statements against the government, the two groups of insurgents began broadcasting from the former Kulmis Radio station, now known as Radio Halgan (fight). Despite this political cooperation, the SNM and SSDF failed to agree on a common strategy against Mogadishu. As a result, the alliance languished. In February 1983, Siad Barre visited northern Somalia in a campaign to discredit the SNM. Among other things, ordered the release of numerous officials and businessmen who had been arrested for antigovernment activities, lifted the state of emergency and announced an amnesty for Somali exiles who wantedto go home. These tactics put the rebels on the political defensive for several months. In November 1983, the SNM Central Committee tried to regain the initiative by holding an emergency meeting to formulate a more aggressive strategy. One result was that the military wing - headed by Abdulqaadir Kosar Abdi, formerly of the SNA - assumed control of the Central Committee to expel the civilian members of all positions of power. However, in July 1984, at the Fourth SNM Congress, held in Ethiopia, the civilians regained control of the address. The delegates also elected Ahmad Mahammad Mahamuud "Silanyo" Chairman of the SNM and reaffirmed its intention to revive the alliance with SSDF. After the Fourth SNM Congress adjourned, the military activity in northern Somalia increased. SNM commands on posts attacked a dozen government soldiers in the vicinity of Hargeisa, Burao, and Berbera. According to the SNM, the SNA responded by shooting 300 people at a demonstration in Burao, sentencing seven youths to death for sedition, and arresting an unknown number of rebel sympathizers. In January 1985, the government executed twenty-eight people in retaliation for antigovernment activity. Between June 1985 and February 1986, the SNM claimed to have carried out thirty deals against government forces in northern Somalia. In addition, the SNM reported that it had killed 476 government soldiers and wounded 263, and had captured eleven vehicles and had destroyed another twenty-two, losing only 38 men and two vehicles. While many independent observers said these figures were exaggerated, SNM operations during the 1985-86 season forced Siad Barre to mount an international effort to cut foreign aid to the rebels. This initiative includes the restoration of diplomatic relations with Libya in exchange for Tripoli's promise to stop supporting SNM. Despite efforts to isolate the rebels, the SNM continued military operations in northern Somalia. Between July and September 1987, the SNM initiated approximately thirty attacks, including one in the northern capital, Hargeysa, none of these, however, weakened the government's control of northern Somalia. A most dramatic event occurred when a unit of SNM kidnapped a team of Doctors Without Borders medical help out of ten French and one in Djibouti to alert the world of politics from Mogadishu to impress the men in refugee camps in the SCN. After ten days, the SNM released the hostages without conditions. Siad Barre responded to these activities by establishing tight security measures across the north of Somalia. The government also evicted suspected pro-SNM nomad communities in the Somali region thiopian border. These measures failed to contain the SNM. In February 1988, the rebels had captured three villages around Togwajale (Geedbalaadh, Godka and another one), a refugee camp near the northwestern border of Somalia and Ethiopia. Following the 1987-88 rebel successes in Somalia, Ethiopia relations began to improve. On 19 March 1988, Siad Barre and Ethiopian President Mengistu Haile Mariam met in Djibouti to discuss ways to reduce tension between the two countries. Although little was done, the two agreed to hold further talks. In late March 1988 the Foreign Minister of Ethiopia, Berhanu Bayih, arrived in Mogadishu for talks with a group of Somali officials, headed by General Ahmad Mahamuud Faarah. On 4 April 1988, the two presidents signed a joint communique in which they agreed to restore diplomatic relations, exchange of prisoners of war, start a mutual withdrawal of troops from the border area, and at the end of subversion and hostile propaganda against each other. Facing a court of military aid from Ethiopia, the SNM had to prove their ability to function as an independent. Therefore, in late May 1988 SNM units left the base camps and Ethiopia launched a major offensive in northern Somalia. The rebels temporarily occupied the provincial capitals of Burao and Hargeysa. These early successes reinforced popular support for the SNM, as thousands of disaffected Isaaq clan members and SNA deserters joined the rebel ranks. In the coming years, the SNM took control of most of northwest Somalia and expanded its area of operations about fifty kilometers east of Erigavo. However, the SNM did not gain control of key cities in the region (ie, Berbera, Hargeysa, Burao, and Boorama), but only succeeded in besieging them. With Ethiopian military assistance is not a factor, the success of SNM depended on their ability to capture weapons from the SNA. The rebels seized numerous vehicles as Toyota Land Cruisers from government forces and subsequently equipped with light and medium weapons, such as 12.7 mm and 14.5 mm machine guns, 106mm recoilless rifles, and BM-21 launchers rockets. Despite these weapons, rebel operations, especially against the major cities of the region, suffered because of inadequate logistics system and the lack of artillery, mine-clearing equipment, ammunition and communications equipment. To weaken the regime of Siad Barre's more, the SNM encouraged the formation of other clan-based insurgent movements and provided them with political and military support. In particular, the SNM maintained close relations with the United Somali Congress (USC), which was active in central Somalia and the Somali Patriotic Movement (SPM), which operated in southern Somalia. Both groups tried to overthrow the regime of Siad Barre, and establish a democratic form of government. The USC, a Hawiye organization founded in 1989, had suffered from factions based on sub-clan rivalries since its creation. General Mohammad Aidid Faarah command Habar Gidir clan and Ali Mahdi Mahammad headed the Abgaal clan. The SPM emerged in March 1989 after a group of Ogaden officers, led by Umar Jess, deserted the SNA and took up arms against Siad Barre. As theUSC, the SPM experienced a division among their ranks. The moderates, under Jess, favored an alliance with the SNM and USC and believed that Somalia should abandon its claims to the Ogaden. SPM hardliners wanted to regain the Ogaden and favored a larger military presence along the border with Ethiopia. On 19 November 1989, the SNM and SPM issued a joint statement announcing the adoption of the position of a "unified policy on domestic and foreign policy." On 12 September 1990, the SNM concluded a similar agreement with USC. Then, on 24 November 1990, the SNM announced it had joined with the SPM and the USC to pursue a common military strategy against the SNA. In fact, the NWS has completed the unification agreement with Aidid, which widened the gap between the two factions of the USC. In early 1991, the three major military rebels had advanced significantly. SNM, but all had taken control of northern Somalia for the capture of the towns of Hargeisa, Berbera, Burao, and Erigavo.